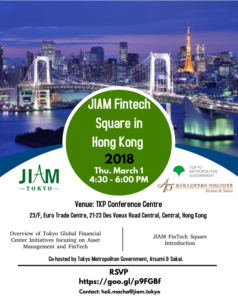 The Consortium for Japan International Asset Management Center Promotion (JIAM), in collaboration with the Tokyo Metropolitan Government and Atsumi & Sakai, organized JIAM Fintech Square Hong Kong Roadshow Event on Friday March 1st, 2018. In order to give a strong push to the Japan Asset Management Industry in Japan, JIAM has been very active lately for the launch preparation of JIAM Fintech Square (JFS) showroom. JIAM has visited in the past few months major financial cities such as New York, Connecticut, London, Paris and Singapore.